AT&T Certified Restored Device An independently tested and reconditioned pre-owned tablet with a 90-day warranty. AT&T Certified Restored Equipment has been thoroughly inspected, tested, and reconditioned to like-new condition. DIRECTV All the TV you love at your fingertips. - Watch live TV, the hottest shows and movies On Demand, your DVR playlist it's all just a tap away1. You can even set your DVR from anywhere, discover new shows, control your TV and more. The DIRECTV app turns your tablet into an entertainment powerhouse. Family device-kids mode Kids Mode, available from Samsung Galaxy Essentials, gives parents peace of mind while providing a colorful, engaging place for kids to play. Easily manage what your kids access and for how long, all while keeping your own documents private. 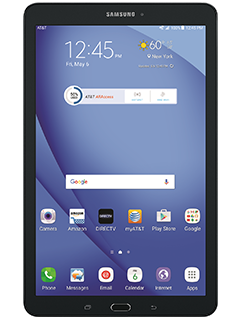 FREE AT&T Certified Restored Samsung Galaxy Tab E when you sign up for a 2-year service agreement. While supplies last. Online only. Requires eligible data plan. Limit 2. Activation ($45), early termination (up to $150) & other fees, charges & restrictions apply. FREE Samsung Galaxy Tab E Tablet: While supplies last (ends 8/31/18 in Puerto Rico). Online only. AT&T Certified Restored only. AT&T Certified Restored is previously opened and/or used equipment (which may be refurbished or remanufactured and may contain original or non-original replacement parts). See att.com/certifiedrestored for details on these devices. Must buy tablet via a new 2-year wireless service agreement w/qual. postpaid data svc (add to select existing plans for $10/mo. to $20/mo. or min. $14.99/mo. on a new eligible plan). Device Limits/Exclusions: Limit 2 per order. May not be combinable w/credits, discounts & offers. Activ. Fee: $45. Early Termination Fee (att.com/equipmentETF): After 14 days, up to $150. GEN. WIRELESS SVC: Subj. to Wireless Customer Agmt (att.com/wca). Credit approval required. Svcs not for resale. Deposit or Advance Payment: May apply. Limits: Purchase & line limits apply. Prices may vary by location. Taxes, fees, monthly, other charges, usage, speed, coverage & other restr's apply per line. See att.com/additionalcharges for details on fees & charges. Promotions, terms & restr’s subject to change & may be modified or terminated at any time.